One of the most widely used herbs, common Sage is valued in many different cuisines and it is easy to grow in the home garden. It not only has a long history in the kitchen but also as a medicinal herb. It is the savory flavour that it imparts to many meat dishes that makes so valued. Easy to grow in containers as well as in the garden, this is a true Mediterranean herb that deserves a place in any kitchen garden. It is widely used in seasonings for meat and poultry and is an essential ingredient of the Italian Classic Saltimbocca. Salvia officinalis is the name of the common sage plant, the most widely used for cooking and it is found in herb gardens around the world. 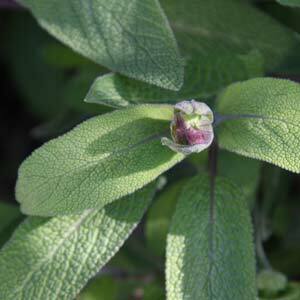 Culinary Sage grows well in a sunny warm spot, not particular about soil type and is fairly easy, once established it is a relatively tough and drought tolerant plant. Easily grown in a pot or container this is a must have plant for the kitchen garden. If is a good idea to prune regularly to maintain a bushy habit, if you use sage regularly usually the picking of the leaves will do this. A little mulch around the plant to maintain a cool root run and some additional water in very dry periods will improve growth. Fertilise in spring with a liquid seaweed fertilise and add some compost and well rotted manure to the soil around the plant before mulching. Try not to over water. Propagation is easy from cuttings taken in late spring to early summer. Choose a humus rich soil well drained with some added compost and cow manure. Plant Sage in a sunny position. Mulch around the plant lightly to suppress weeds and retain a cool root run. Give the plant around 1 metre space, as they will grow to a large plant. Water during long dry spells in summer. Replace the plant every 5 – 6 years as they become old and woody.